Our product range includes a wide range of silk thread jewellery (necklace, earrings & bangles), silk thread jewellery and multi-colored silk thread earring. Color Blue, Golden, Light Greenm etc. Color Blue, Red, Yellow, Green, etc. 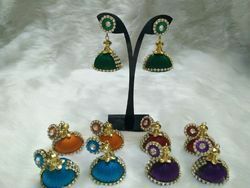 This kit comes with round jhumka base, in 4 different sizes. 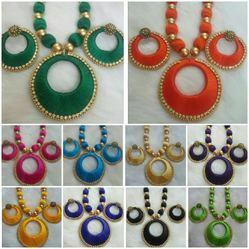 Chandbali/ Half moon in 3 different sizes - small, medium & large and dropped earring bases. You also get plastic rings in 3 different sizes which can be stacked upon one another to make beautiful earrings. Pair of antique studs with shiny bright silk thread spools with wooden beads which is very popular in silk thread jhumkas and necklace. color Green, Yellow, Blue, Black, Red, Purple, etc. Enriched by our vast industrial experience in this business, we are involved in offering an enormous quality range of Multi-Colored Silk Thread Earring.